The Browns will take another shot at this quarterback thing with Johnny Manziel. According to Sal Paolantonio, owner Jimmy Haslam was swayed to pick Manziel by a homeless man. OK.
"I can go out to dinner anywhere in Tennessee and nobody bothers me." That's his home state. But he said, "Here in Cleveland, everywhere I go, people know me. And I was out to dinner recently. And a homeless person was out on the street, looked up at me and said, 'Draft Manziel.' Just like that." And that convinced him, that the Cleveland Browns' fans wanted Manziel. Cleveland took defensive back Justin Gilbert with the eighth pick, and eventually traded with the Eagles to the 22nd spot to nab Manziel, who was ignored by teams like the Vikings and Titans. 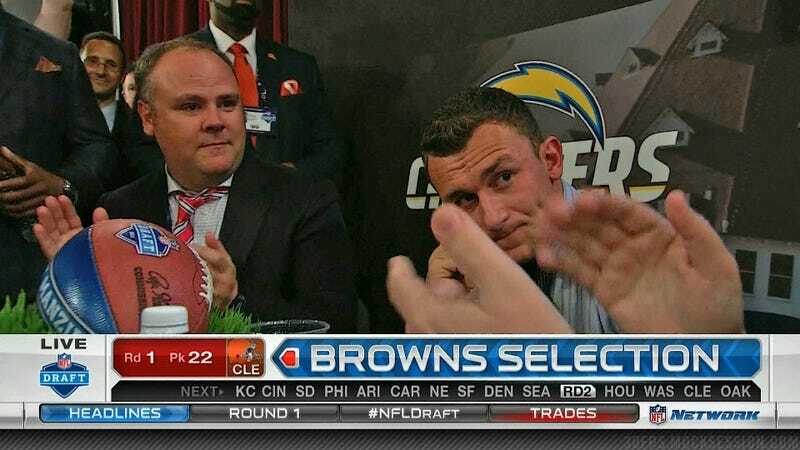 Manziel gets to throw to Josh Gordon and Jordan Cameron. With cautious optimism, this could be really fun.